Post two of apple week features a great fall weeknight meal. This is one of those rare comfort dishes that comes together really quickly – thin chicken breasts cook in no time and the rich sauce only takes a couple of ingredients but packs real flavor. 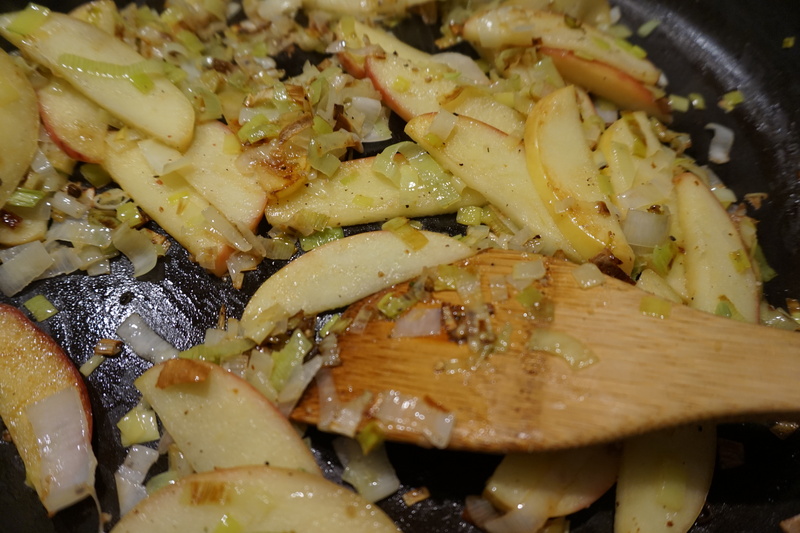 Paired up with our apples are leeks to add a nice savory element. 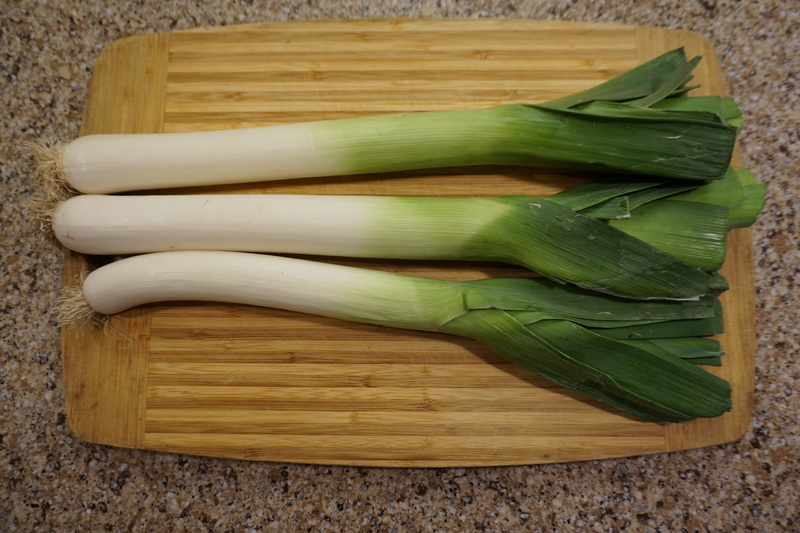 If you haven’t cooked with leeks before, fall is a great time to start experimenting with them. They are the huge green onion looking things at your grocery store. They have a really soft onion flavor that doesn’t overwhelm. The only barrier to using them is learning how to clean them. All of those lovely layers of leek trap dirt when they are pulled from the ground so you definitely want to be careful to clean them, otherwise you are going to end up with grit in your dish. The best way I have found to clean them is first to lop off the tough and inedible top dark green parts. 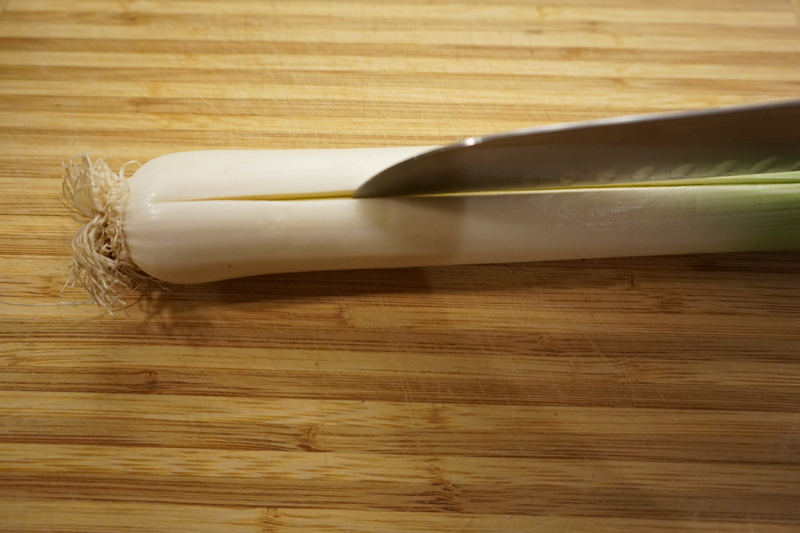 Then cut them lengthwise down the middle making sure not to cut through the root so it can still hold the leek together. 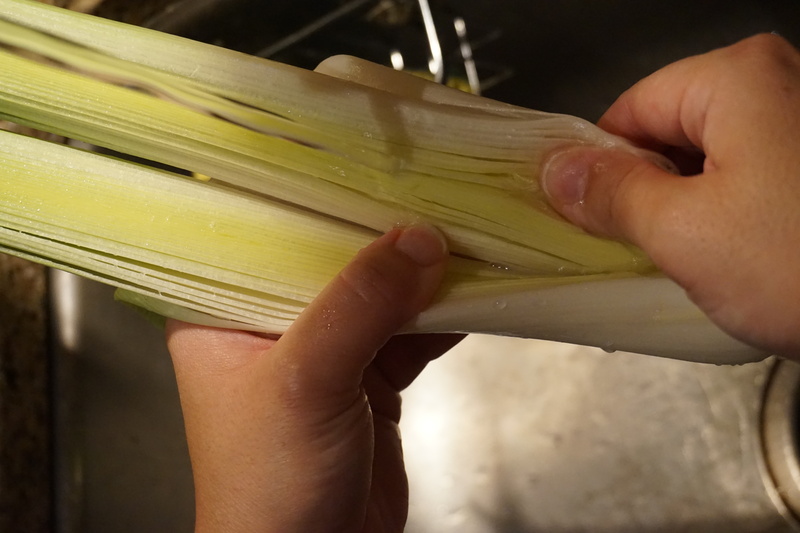 Then run the halved leek under cold water, using your fingers to spread out the layers and rinse in between them, getting rid of any dirt caught in between. Now you can slice like normal, safe in the knowledge that you have dirt free leeks. 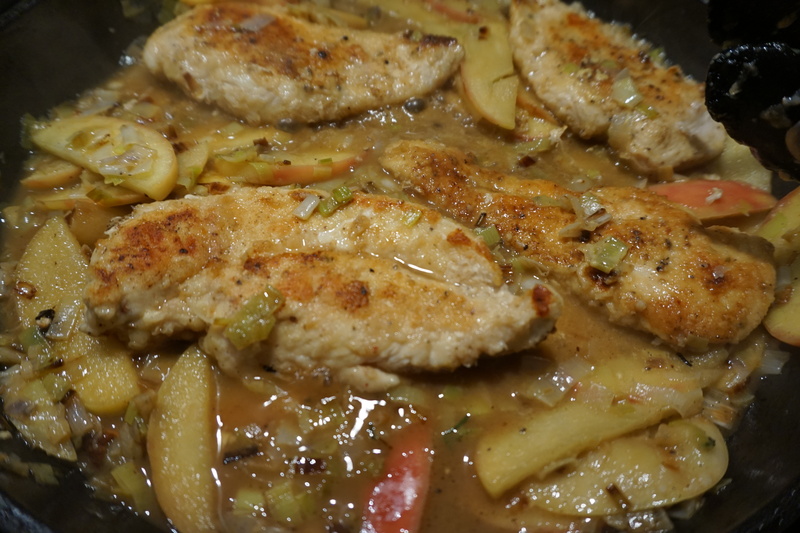 The leeks are great with the apple, and then the addition of dijon and apple cider give the sauce some nice bite while cream helps smooth everything out. I like to serve this with rice or rosemary polenta and some roasted veggies but it would also be great over egg noodles like a stroganoff. Make sure to check back Friday for the last apple recipe of the week (spoiler alert – there is cheese involved). In a large skillet heat the olive oil and 1 tablespoon of butter over medium to medium high heat. 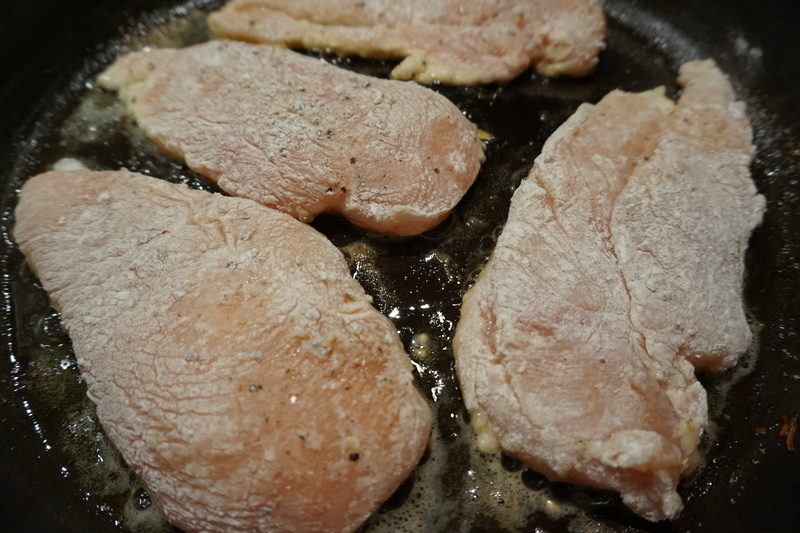 Dredge the chicken breasts in the flour, shake off the excess and add to the pan. Cook them 4 minutes without disturbing them and then flip them and cook for 4 more minutes. Remove the chicken and set aside, then add the remaining 2 tablespoons of butter to the pan. Add the leeks, apple and garlic and cook for 6 minutes over medium until the leek and apple have softened. Return the chicken to the pan and add the dijon, cider and chicken stock. Let simmer for 5 minutes to finish cooking through the chicken and allowing the flavors to come together. Stir in the rosemary and cream and cook for 2 more minutes. In a large skillet heat the olive oil and 1 tablespoon of butter over medium to medium high heat. 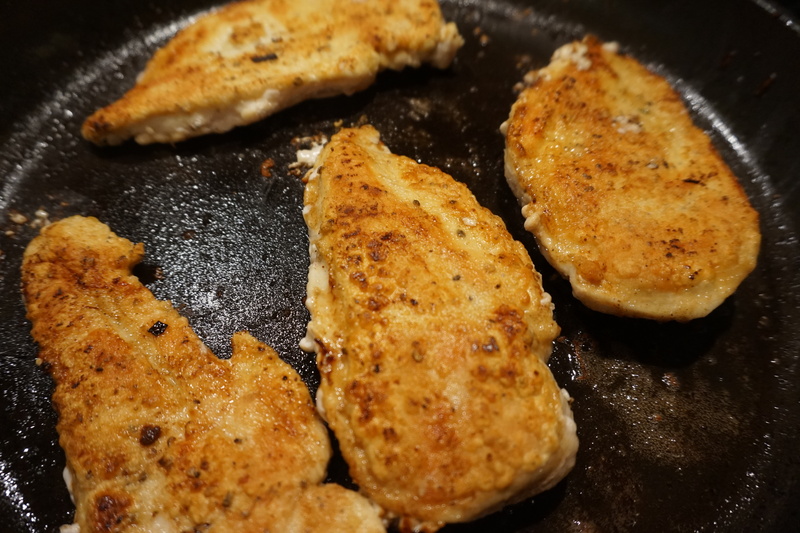 Dredge the chicken breasts in the flour, shake off the excess and add to the pan. Cook them 4 minutes without disturbing them and then flip them and cook for 4 more minutes. Remove the chicken and set aside, then add the remaining 2 tablespoons of butter to the pan. Add the leeks, apple and garlic and cook for 6 minutes over medium until the leek and apple have softened. Return the chicken to the pan and add the dijon, cider and chicken stock. Let simmer for 5 minutes to finish cooking through the chicken and allowing the flavors to come together. Stir in the rosemary and cream and cook for 2 more minutes.